The Buffalo Grove Golf & Sports Center Open Weekdays from 9 AM to 10 PM, but closing early on New Years Eve, call (847)-459-2321 for details. Bgparks.org online for more information. Todd Sones FREE clinics coming again in January. BY: Rory Spears, with the Wicker Basket at Merion. 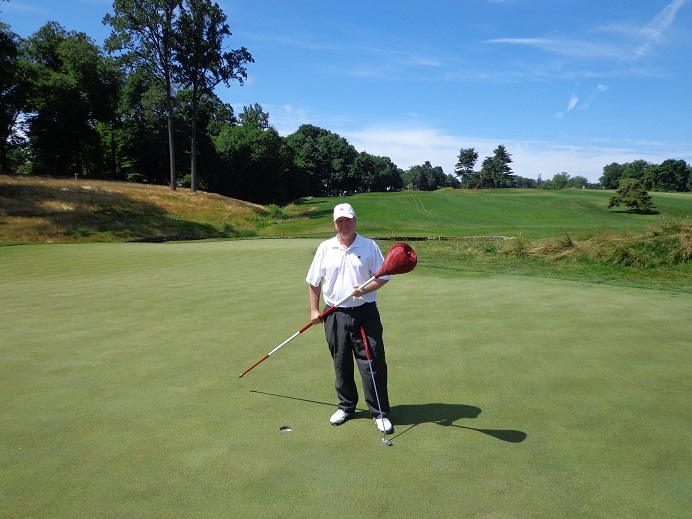 When I think back to 2014, I’ll think back to my return at Merion in early July. I must say that Merion remains my favorite course that I have played, that might change someday but for now Merion remains on top. In October I played Shinnecock Hills and it’s very good, I thought going in it might be my new No.1 when I finished the 18 holes there but it had to settle for No.2. Regardless both courses are very good, and a must play if you ever have the chance to play there. Both courses test your game in ways you don’t see everyday. You don’t have to play the tips at either course to have your hands full. I had the chance to play several top courses this year, and each test of golf was more exciting than the next one. If you haven’t taken the time to play a real top course in 2014 or even ever, make 2015 your time to do so. You will be glad you did. Golfersongolf.com Chicago’s winter home for golf news. Follow us on Facebook and Linkedin under Rory Spears, or on Twitter @GogBlogGuy. When it comes to playing top courses, you do have choices. There are several public courses that have or will host U.S. Opens. Pebble Beach, Pinehurst, Bethpage Black, Torrey Pines, Erin Hills, and Chambers Bay that will host the U.S. Open this coming year. There are public courses that have hosted PGA Championships, like Pinehurst, The Ocean Course at Kiawah Island, Whistling Straits in Wisconsin. there are public courses that have hosted Fed Ex Cup Playoff Events, U.S. Amateurs (like Cog Hill) and more. So why not take a day, at least one day for a round of golf at a top championship public course. There is no feeling like playing one of these type courses. Both Harbor Shores in Michigan and the French Lick Resort will be or have hosted the Sr. PGA Championship in 2014 (HSGC) and 2015 (FLR). There are some ways you can play a championship private club. If you don’t know a member, or have a business contact, find a top club that supports a charity close to your heart and pay the extra bucks to play. Maybe you can just find a good charity that could use the support. You can always visit Top 100 lists from various publications, and play courses that are on these lists. Even if they have not hosted a major or a PGA Tour event, most of them are very good golf courses. As 2014 comes to a close, I’ll start planing where I want to play in 2015. I’m looking forward to adding some courses to my list of courses I have never played before. My number of courses played is close to 450 in some 37 states. While it’s nice to play courses you know very well, it’s nice to play new challenges. As somebody once said, variety is the spice of life. Addisonparks.org The golf dome is open, go practice your game. I’ll return on Wednesday to wrap up 2014 and over the first few days of 2015 I’ll have some thoughts about the year ahead. Both local picture and on the national scene. If you got new clubs for Christmas, go hit the domes and start breaking them in. If you have gift cards from golf stores, it’s time to go visit, test some clubs and or get fitted. If you want to test some clubs first, start looking for the demo days at the area’s domes. Sometimes you can get great deals if you buy at demo day, do inquire.